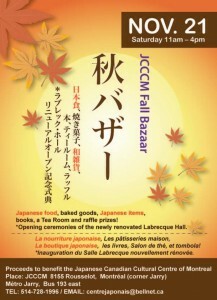 This is a quick update to let you know about the upcoming Japanese Fall Bazaar that will take place at the Japanese Canadian Cultural Center of Montreal (JCCCM) this coming Saturday, November 21st from 11am to 4pm. Please drop by to try some Japanese food and baked goods that you can enjoy in our tea room or take home, and enjoy the opportunity to purchase various Japanese items, books and raffle tickets all in support of the JCCCM! A brief ceremony celebrating the opening of the newly renovated and beautiful Labrecque Hall will also take place Saturday. As for Arashi, we have been busy volunteering at the recent Mochitsuki, giving workshops and making manju for the upcoming Fall Bazaar and we are very grateful to all students and friends that have also contributed time and energy to events that help support the JCCCM. Thank you! Our performance season has pretty much wrapped up for 2015, but we are back in training, brushing up pieces for next year’s performance season. We look forward to seeing you at the bazaar and during the 2016 performance season!